Spider-Man and Venom: Maximum Carnage is a scrolling fighting game for the Super NES and Sega Mega Drive/Genesis, developed by Software Creations and published by LJN (a subsidiary of Acclaim) in 1994. The game, based on a sprawling comic book story arc of the same name, featured numerous heroes, including Spider-Man, Venom, and their allies from the Marvel Comics fictional universe like Captain America, Black Cat, Iron Fist, Cloak and Dagger, Deathlok, Morbius the Living Vampire, and Firestar, all teaming up to battle an onslaught of villains led by Carnage, including Shriek, Doppelganger, Demogoblin, and Carrion. 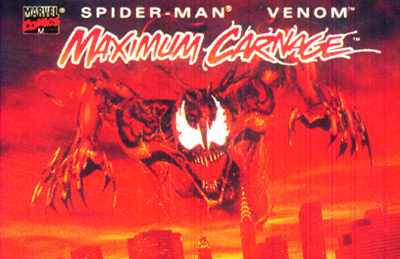 Maximum Carnage is notable as one of the first video games to be directly based on a comic book story, rather than simply using comics characters in a standard video game "action/adventure" plot. Many of the game's cut scenes feature semi-animated versions of art taken directly from the comics. It was also notable as being the first Spider-Man video game to receive a teen rating. The game's soundtrack was provided by American rock group Green Jelly. The title screen theme song appears as the first track on the band's 1994 album 333 as "Carnage Rules". However, due to the state of video game music technology at that time, the soundtrack was not recorded music, but a computerized rendition of the songs.